Check out A Death in Deep Ellum, my latest published short fiction out in Switchblade, Issue 2. Available in paperback or for Kindle. It's always a great and gratifying privilege to be published in Ellery Queen's Mystery Magazine (EQMM). Once again, if you like mysteries and you're not a subscriber then you're missing out. Stephen King calls it "the best mystery magazine in the world, bar none," and the list of its prestigious bylines goes on and on from Rudyard Kipling to Ernest Hemingway. So check it out. This time around I'm pleased to have another installment of my Redfish Bay series featured: "The Model Citizen." The hero of the series, an amateur detective and full-time beach bum in Corpus Christi, Texas, is called upon by an old friend to help solve the theft of a model boat stolen from a museum; a model made by a high-profile ex-con-turned-successful-sculptor. Killer news! My latest book, Untimely Demise: A Miscellany of Murder, is now officially out. 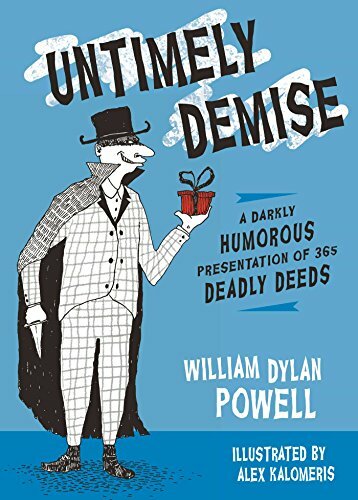 Untimely Demise lays forth the dastardly details of 300+ fascinating, ritualistic, and just plain bizarre ways people have murdered one another throughout history are revealed in this darkly humorous, illustrated miscellany of murder. Who would write such a sick book? Yep, you guessed it. You're welcome, humanity! Killed with a toilet? Deadly belt buckles? Sexed to death? Untimely Demise: A Miscellany of Murder is a darkly comedic exploration of the 365 most fascinating ways people have offed one another since the beginning of time, from ninja swords to pernicious poisons, mobster murders to sneaky sabotage—and everything in between. Whether you love a good whodunit or solve real-life murders for a living, this daily dose of dastardly deeds will shock and amaze you! Or, at least, remind you to lock your doors at night. You can order Untimely Demise from Amazon, straight from Cider Mill Press or at a bookseller near you who might have questionable standards. Houston peeps are invited to support your local independent booksellers and pick up a copy at Murder by the Book. I'm always thrilled to have a story published in Ellery Queen's Mystery Magazine (EQMM). If you like mysteries and aren't yet a subscriber, check it out. In print since 1941, Rudyard Kipling, William Faulkner, Ernest Hemingway and Norman Mailer have all had stories published in EQMM. Stephen King calls it "the best mystery magazine in the world, bar none." This time my story is part of the Redfish Bay series, and called "The Nightwatchman's Wife." It's a good old fashioned ghost tale set on the retired aircraft carrier U.S.S. Lexington (often called the "Blue Ghost"). Order a copy and check it out. It involves a mysterious sighting, Halloween night, a missing piece of expensive jewelry, a boat on which many souls have lost their lives and, as always in the series, a monkey that causes a lot of trouble.